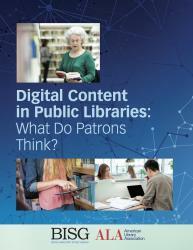 I recently downloaded and read the executive summary of “Digital Content in Public Libraries: What Do Patrons Think?” It’s the result of the first joint research initiative with the American Library Association (ALA) and the Book Industry Study Group (BISG). The study also seems to confirm a general decline in the use of ebooks by library patrons: “Over the past 12 months, 96% of survey respondents read at least one print book, while 44% read at least one ebook.” For a while—2014, mainly—it was clear that about half of our patrons had ebook readers or tablets and wanted ebooks. Now it’s 44%. It turns out that most library patrons prefer to check out physical books (75% had in the past 12 months) over ebooks (25% had checked out an ebook), and physical audiobooks (80% had not checked one out) over digital (95% hadn’t). And why don’t they read ebooks from the library? Either the library doesn’t have them at all, doesn’t have enough copies of popular titles (the younger the patrons, the less likely they were to put it on hold and wait), or the patron can’t find them because they’re not in the catalog, which is what they prefer. That is, ebooks need MARC records, not their own, unintegrated apps. Another couple of findings: Most people don’t look for children’s ebooks; they want paper. The mystery/thriller genre was the single most popular kind of ebook, which contradicts ebook sales, where romance is king. But here’s where I think a nonobvious truth starts to emerge. People come to the library because they like what it has. They go somewhere else if they like ebooks. The limitation of the study is that it is only presents findings from library users. I truly believe, based on my own observation and my own changing pattern of use, that people who do read ebooks (and I read a book a day) have kind of given up on the library. Romance readers are the example: They can’t get the quantity of what they want, so they go elsewhere to new, nonlibrary channels. Once they find what they want, they just don’t get to the library as often. The ALA/BISG study did in fact find a correlation between ebook use and declining library visits. In other words, people come to the library because they like what it has. They go somewhere else if they like ebooks. On the one hand, this suggests that traditional libraries have a shelf life that won’t end anytime soon. On the other, I wonder if we don’t need to find a way to survey nonlibrary ebook readers. Have we lost them for good? JAMES LARUE will become director of ALA’s Office for Intellectual Freedom in January 2016. He can be reached in the meantime at jlarue@jlarue.com.